Carlson’s love of skiing started with lessons at age 3 with the Quechee Ski Bees. Getting to lessons was easy, she would ski down from their house with her parents, and as she got older by herself. Not only did she learn independence and responsibility, she got herself to her lessons and eventually to ski practice. Carlson joined the Quechee Ski Team when she was 7 or 8 as part of the Mountain Team. 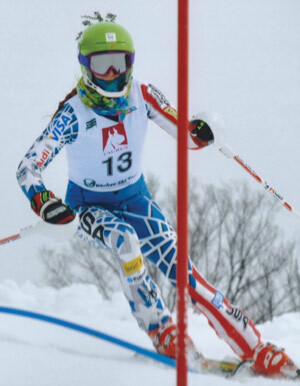 Now, her other passion, synchronized swimming has taken some of her time away from being a competitive skier, and these days when she can she trains with the ski team. A high school sophomore, Carlson is a very busy, disciplined teenager. On Tuesdays and Thursdays after school, five hours on Saturdays, and six hours on Sundays, she’s in the pool training for qualifying meets to compete in the U.S. Nationals and Junior Olympics in synchronized swimming this coming spring. Carlson competes in both team and solo synchronized swimming. It’s a complicated and difficult sport, combining swimming, dance, and gymnastic skills in a team of eight, a combo of 10, a duet of two, or as a soloist. Synchronized swimming requires advanced swimming skills, great strength, endurance, flexibility, grace, artistry, and precise timing, as well as incredible breath control. It’s about interpreting the theme of the music and telling a story. Even in team competitions, individuals are required to show off certain moves, which are scored separately and added to the final team score. As a soloist, Carlson has to be a higher-performing swimmer. Rather than being synchronized to other athletes, a soloist is synchronized to the music while demonstrating athletic skill, creativity, and her ability to tell a story through her swimming and emotional connection with the judges. She first hit the water at 2-years old, swimming away in a pool in a quarry in Rockport, MA. Carlson officially started swimming lessons when she was 3. As a second grader, she passed a poster for synchronized swimming at the YMCA every time she went for swimming lessons. She asked to try, and her parents enrolled her in an “Intro to Synchro” class at the Y. 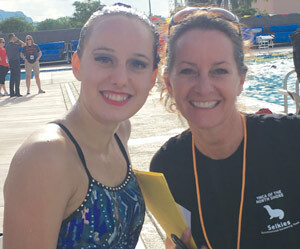 She took that class a few times, went to view the Synchro Team’s “water show,” and was inspired to join the Intermediate Team the following year. Carlson swam for The Selkies of the YMCA of the North Shore until the end of last year. For the past two seasons, she also swam for New England Synchro, another competitive team that combines athletes from other nearby towns. Last year, she and her New England Synchro team came in first in their age group at the U.S. Nationals. This coming year, she will be swimming with ANA Synchro in Andover, MA. Given all her swimming requirements, Carlson isn’t able to compete on the Quechee Ski Team anymore. “She would love to compete [for Quechee] all winter, but the reality is that as she has become a more competitive swimmer she has had to make choices,” says her mom. Several years ago, in the heart of the ski season, she had a hard time thinking of herself as a swimmer in the winter, she was a skier, but once her competitive swim season rolled around in the early spring, it was hard to think of herself as anything but a swimmer. She is, able to compete on her high school ski team, allowing her to continue participating in a sport she excels at and loves. Her experience spending so much time in Quechee has given her many gifts. She will be a lifelong skier, able to handle any terrain, any conditions, anywhere. Also, a sense of freedom and security, as a tween and teenager, she roamed the ski hill with her friends, coming home only for lunch, and perhaps to dry off a bit. While she and her friends felt like they were completely on their own without parent supervision, there were plenty of people watching out for them—family, friends, the ski patrol, and the lifties. “I never felt like my kids weren't safe when they were free skiing, even when they were just out with their friends," says Harlow-Carlson. I asked Harlow-Carlson what her favorite part about Quechee is, and, besides the wonderful freedom of the ski hill, she mentions the friendships they have developed over the years. "We have fostered friendships with the families we have met through Quechee… there is a common denominator when you find families that also choose to travel up north every weekend of the winter, together as a family, to spend time outdoors. We love the group of friends we have made,” she says. Community, support, children, that’s what Quechee is all about.